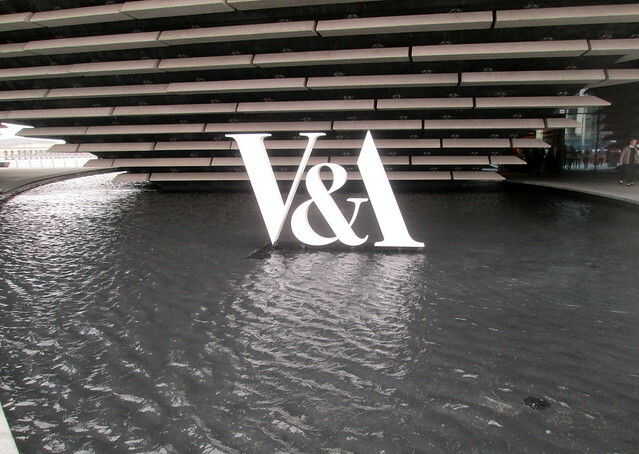 We’ve been to the V&A at Dundee a couple of times now since it opened recently, the second time we had hoped that it wouldn’t be quite so busy – but it was. 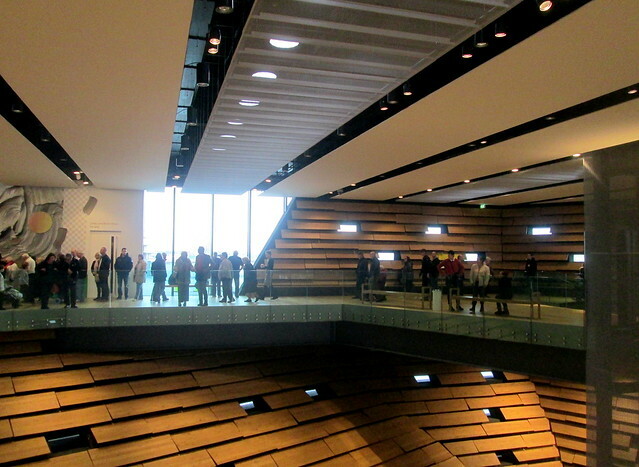 I think it’ll be quite some time before the visitor numbers settle down a wee bit. 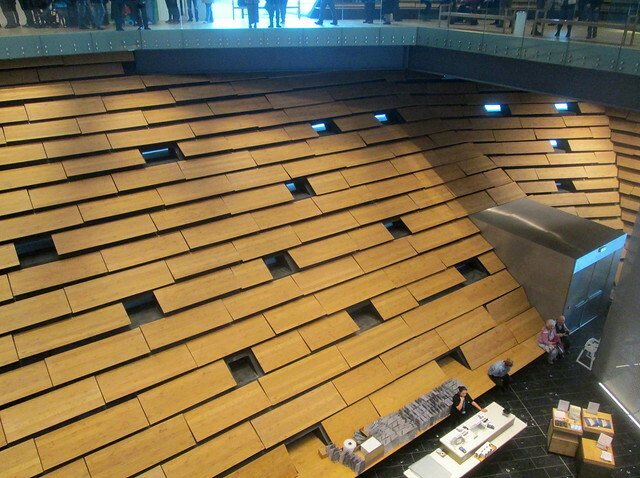 Below is a close up of one of the walls so you can see how curvaceous it is. 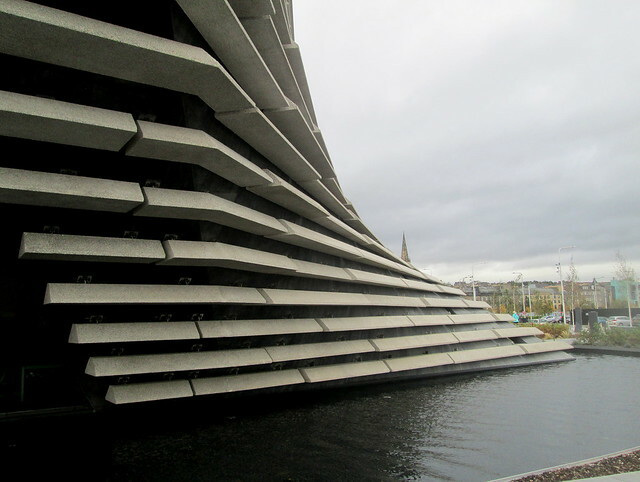 We’ve watched this building grow very slowly for years and it seemed at times that it would never be finished so it’s no surprise that people have been chewing at the bit to get into it. 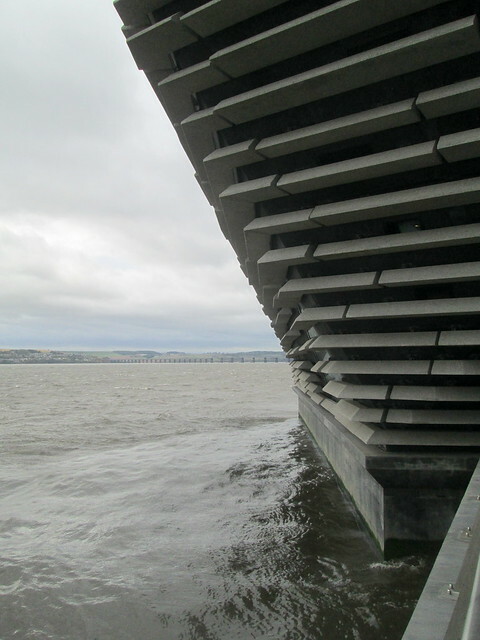 In parts it overhangs the River Tay and I’m not sure if it’s meant to be inspired by a ship or Scottish cliffs, or a conglomeration of both. 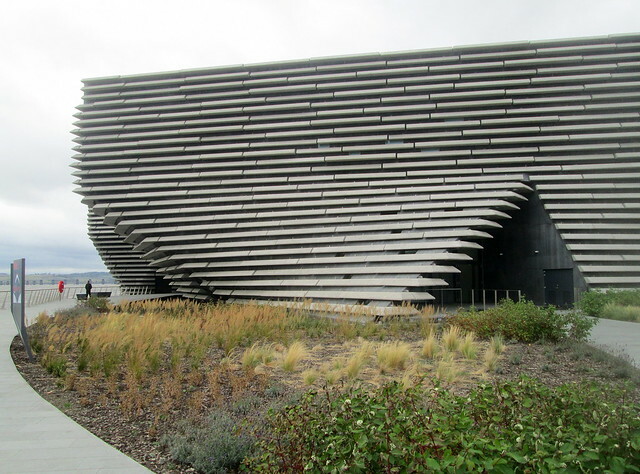 Dundee was famous for shipbuilding in the past. It looks like a perfect nesting place for seabirds of which there are plenty around here, but apparently they are being kept at bay by the use of sonar. The weather in Dundee does get pretty wild at times so I hope that the planting has been chosen for hardiness. I think it’s supposed to be prairie planting. It’ll be interesting to see if it survives. 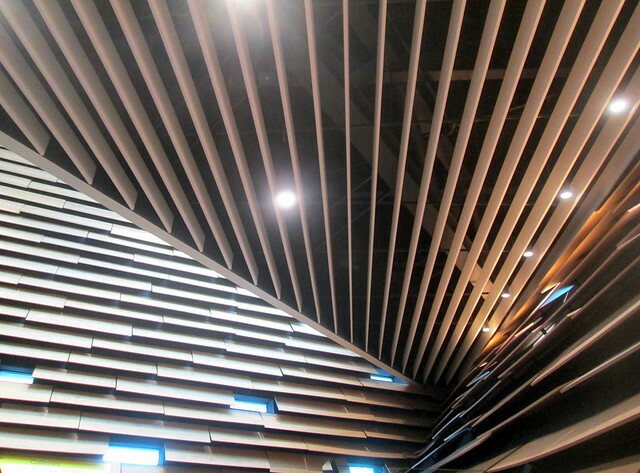 The interior is definitely different with this angled slatted shingle effect which is reminiscent of an old ship. 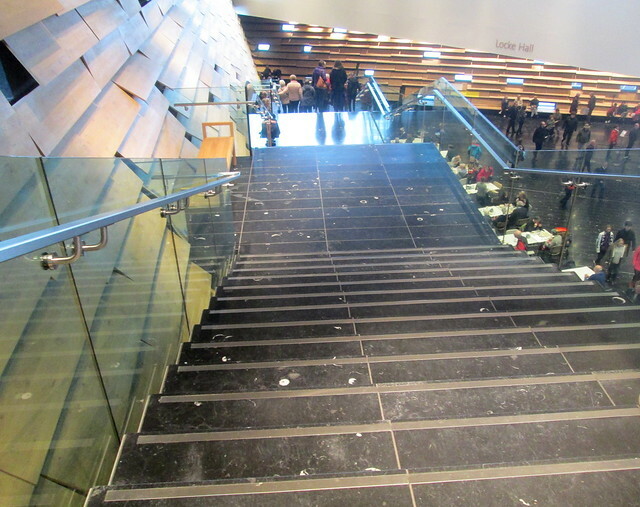 The staircase is elegant I think. 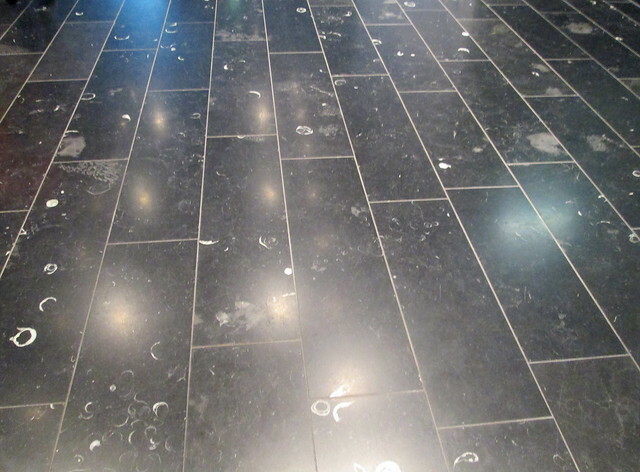 I’m not sure if the stone of the floors and stairs is natural or some kind of man made substitute, but it looks like it has all sorts of fossils embedded in it. If you want to see more photos you should click over to Jack’s post here. By the time we reached Grasmere last week dusk was beginning to fall, and as our hotel was a mile or so outside the village we drove into Grasmere and parked outside Dove Cottage, the home of William Wordsworth and his sister Dorothy to begin with and then after he got married they had to eventually squash five kids in there too. 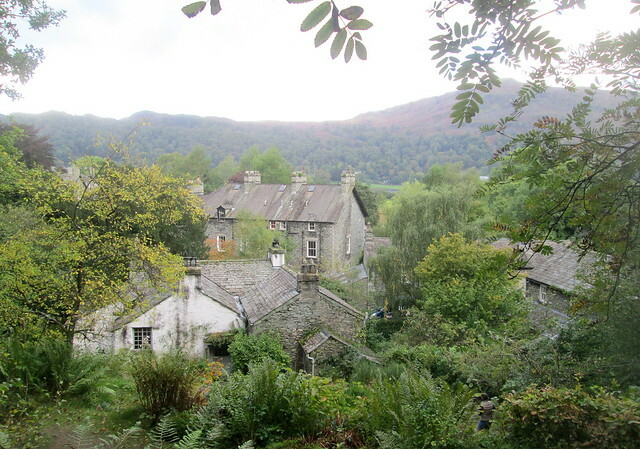 When the Wordsworths lived in the cottage there were none of the buildings around it that you see now, and they had an unrestricted view of the lake. 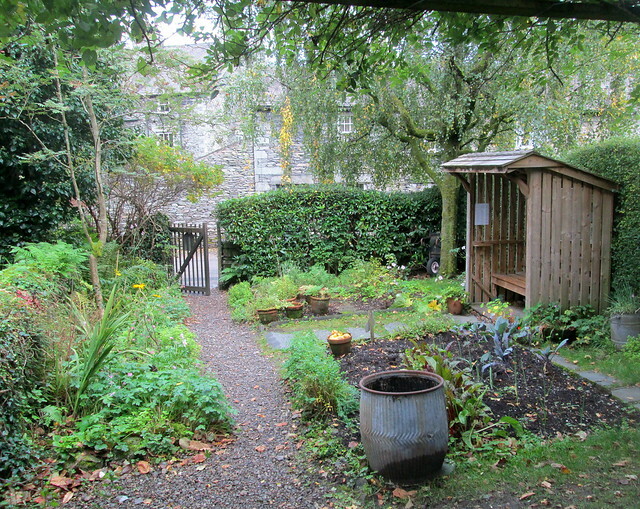 I was really glad that we decided to have a snoop around after the cottage was closed as we had it to ourselves and were able to look around the garden in peace. 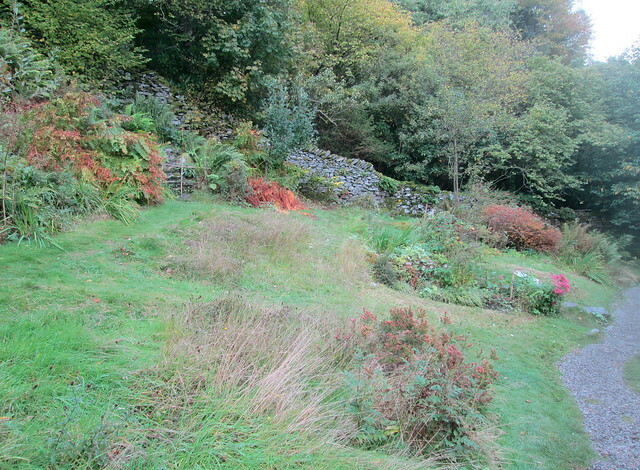 The garden is situated on a sloping site, it’s a bit neglected at the moment, I think they must be in need of some gardening volunteers, it’s a pity I live too far away! 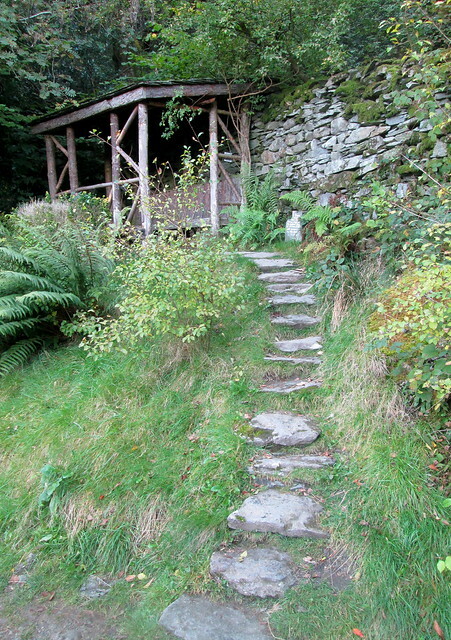 Steps lead up to what was a favourite spot with Wordsworth, this refurbished summer gazebo. Back down close to the cottage some vegetables are being grown in the area where apparently an outhouse had stood in Wordsworth’s day. As it’s only a few steps from the cottage it must have been the earth closet. 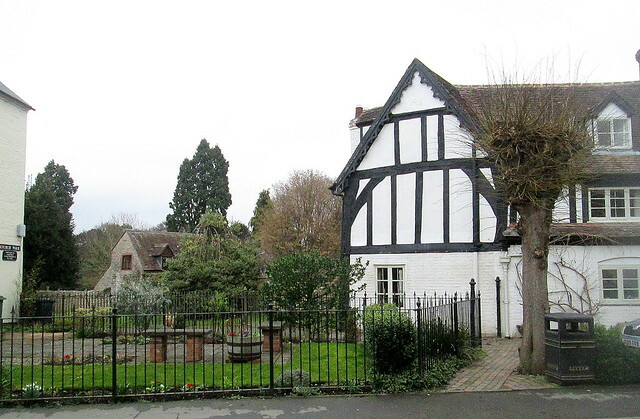 That would have been particularly handy as originally the cottage had been a pub and William and Dorothy were the first people to live in it as a home. 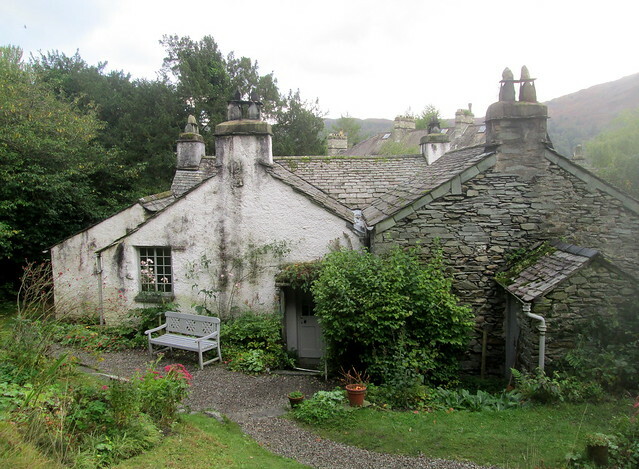 It’s a tiny cottage and it’s very dark downstairs and would have been even darker in Wordsworth’s day as the windows have been enlarged since then. 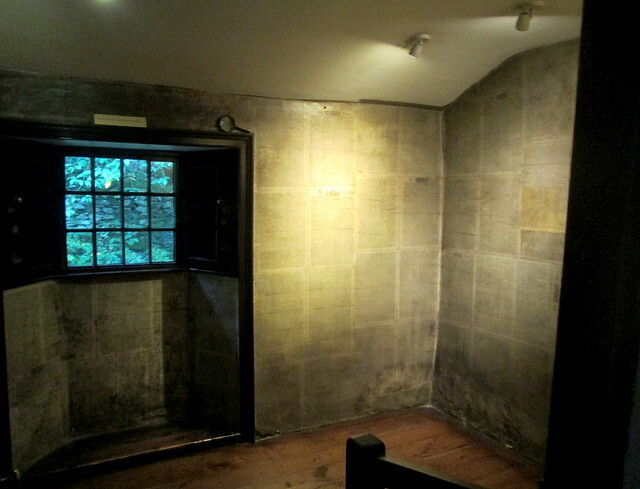 We didn’t manage to get any photos of the downstairs but it consists of a small kitchen, a buttery which is a teeny wee room where they stored perishable food and a small living room which must have been used as a bedroom when all the children began to arrive. It feels a lot colder than the kitchen and you can hear the stream which flows underneath it. When it was in use they probably prised one of the slates up from the floor so they could place a container of milk in it to keep it fresh. They must have got their water from there too. There’s a small living room, quite cosy really. Upstairs there are three small bedrooms. 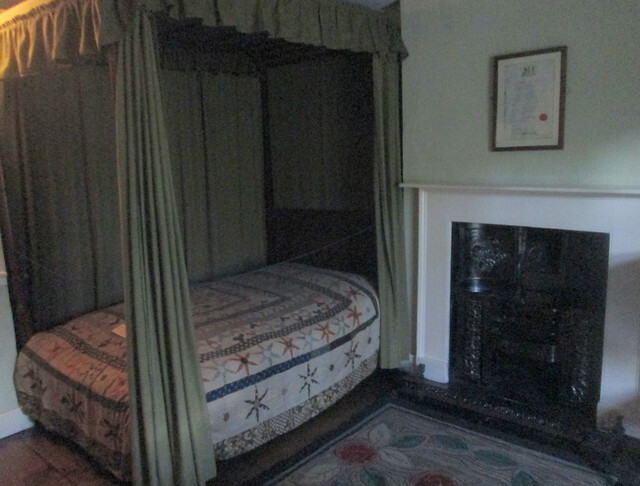 The one below was William’s, it was very cold upstairs as the fireplace couldn’t be used, the room quickly filled with smoke apparently. Dorothy chose thie tiny room below. In her day she papered the walls with old newspapers, presumably in an effort to insulate the place. It has been repapered since then but as you can see the damp is coming through badly. There is no fireplace in this room and it is directly above the cold buttery. I can see why she chose it though as it’s at least private, you have to walk through the other bedroom to get into this one. 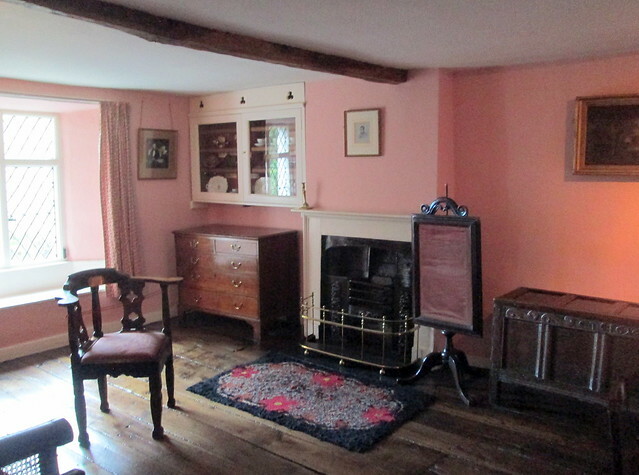 The upstairs sitting room is lovely and bright and the furniture and china did actually belong to the Wordsworths. 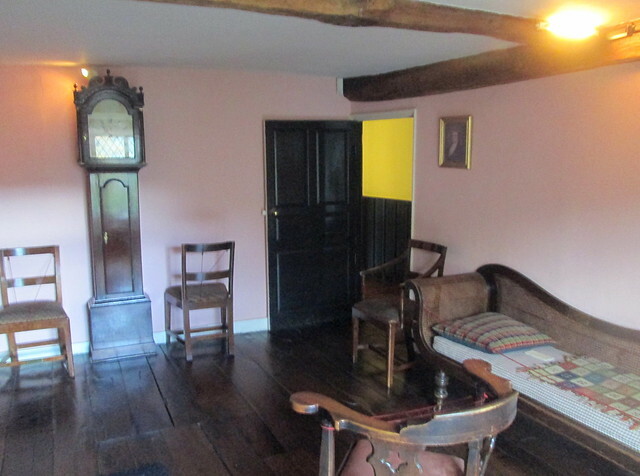 Normally the cottage housed eight people, the five children, William, Mary his wife, Dorothy his sister and another female relative and Dorothy wrote in her diary that at one point there were fifteen people staying in the house, it’s one way of keeping warm I suppose! Sir Walter Scott visited them and I can just imagine his astonishment at the size and simplicity of the place. 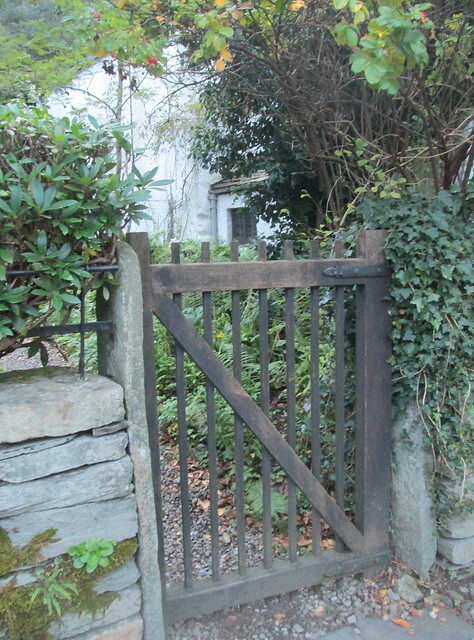 But Wordsworth was very happy here and although they did later move to a house in nearby Rydal, in the end they all came back to Grasmere to be buried. 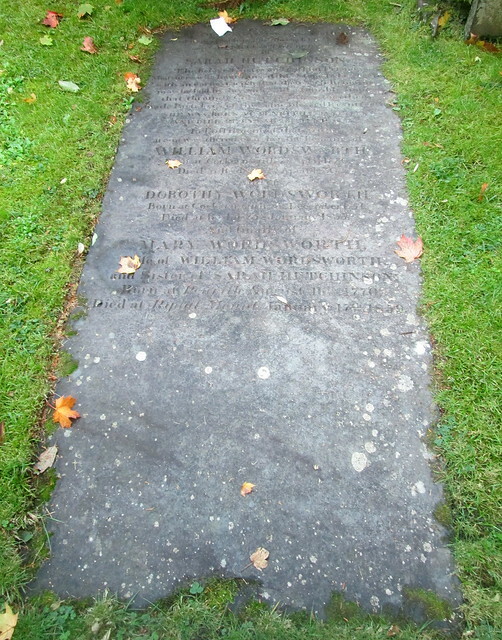 There are lots of Wordsworths in the graveyard. 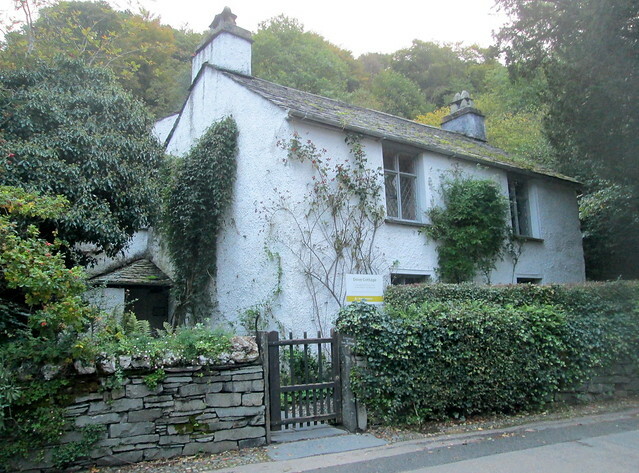 The entry charge also includes a visit to the nearby Wordsworth museum which is very interesting and contains a lot of personal things, including Wordsworth’s dental ‘pokey’ things and some of his clothes. We were really glad that we had visited the exterior of the house earlier as by the time we got there just before the cottage opened in the morning hordes of foreign students turned up just behind us, luckily we managed to get in just before they did, otherwise we couldn’t have taken any photos at all. They were Dutch I think, so surprising as I wouldn’t have thought Wordsworth would be well known there. 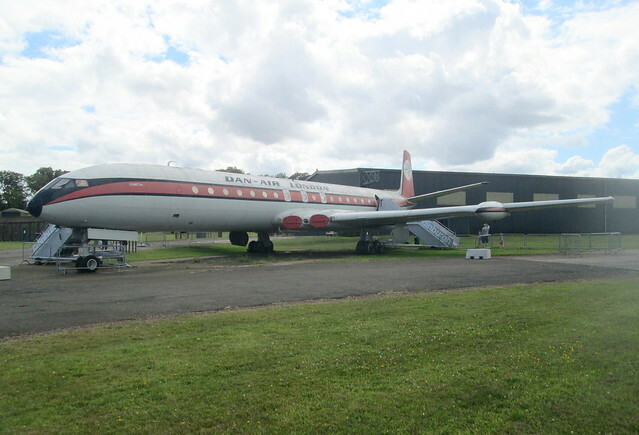 The National Museum of Flight at East Fortune, North Berwick is home to commercial aeroplanes as well as military ones, and most of those ones you can actually board and have a look around. 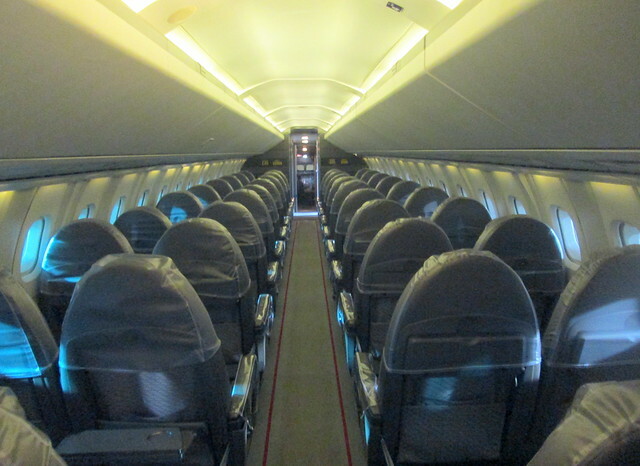 Below is a Dan Air Comet. 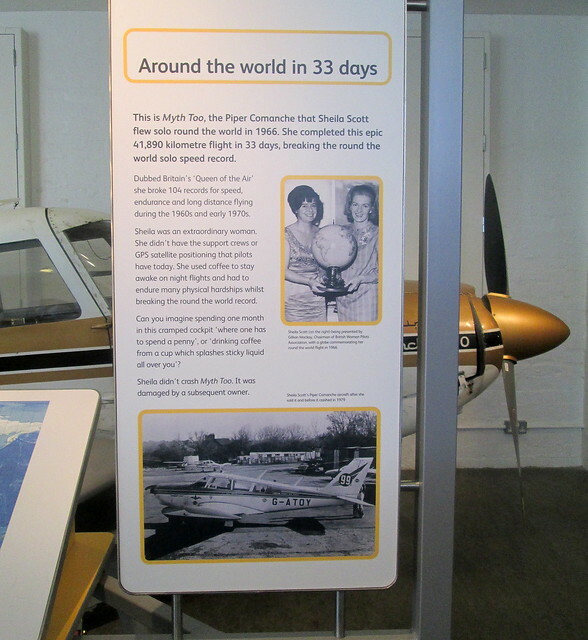 Now I have to admit that I had never heard of Sheila Scott, but she flew solo around the world in 1966, in 33 days in her ‘plane Myth Too. 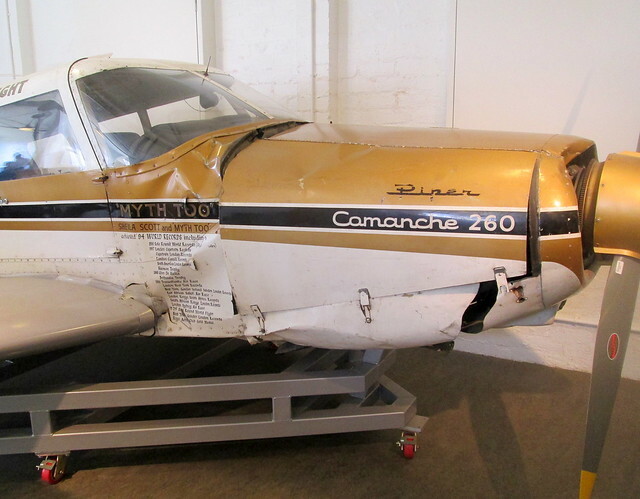 It’s a Piper Comanche and as you can see from the photo it’s quite bashed up, but this damage was inflicted on Myth Too by the man that it was sold to! You would think she would want to hold onto that ‘plane but maybe she needed to sell it to buy another one. 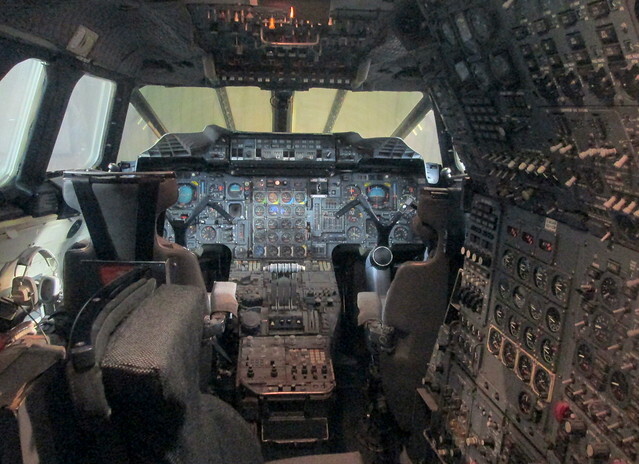 And Concorde’s cockpit which I have to say looks absolutely terrifying to me. 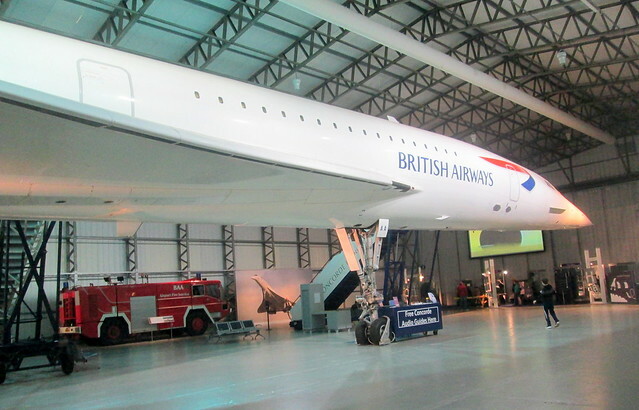 This Concorde had to have its wings temporarily removed when it was put on a barge on the Thames as part of its journey to East Fortune, the landing strips there aren’t quite long enough for Concorde to be able to fly there. You can see the photos here. 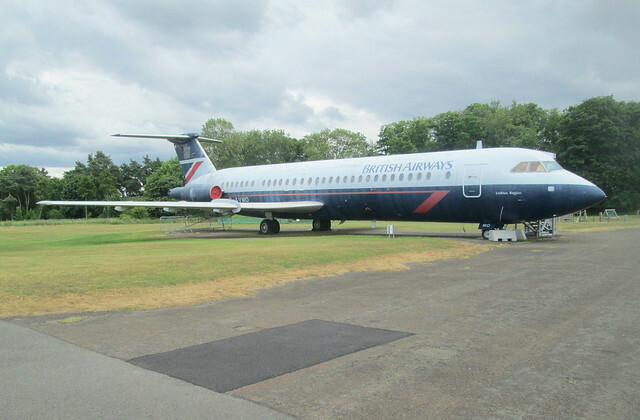 One day last month we visited The National Museum of Flight at East Fortune airfield in North Berwick for the first time. 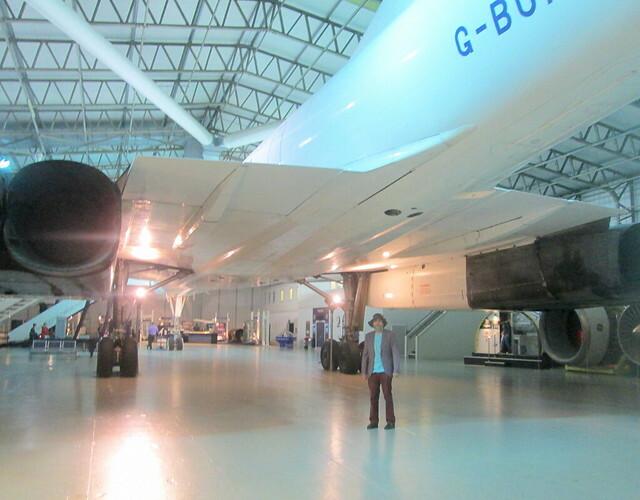 It’s a great place, there’s so much to see, including an actual Concorde! Quite a lot of the original buildings are still in existence, during both world wars this place was bustling with activity, and had thousands of men and women from many various countries stationed here. It’s obviously on a large rural site and the closest town is North Berwick, not that that is exactly a metropolis. 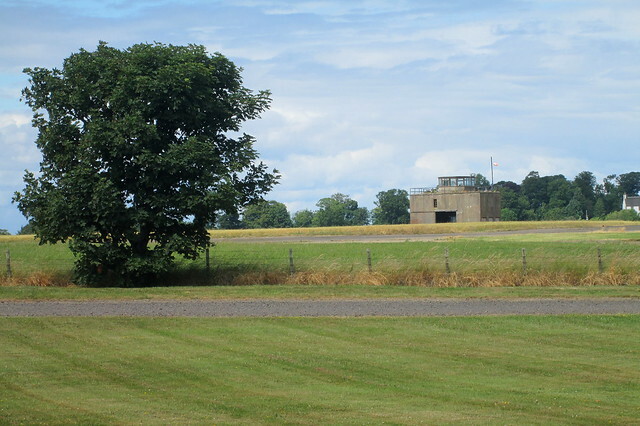 Below is a photo of the control tower. 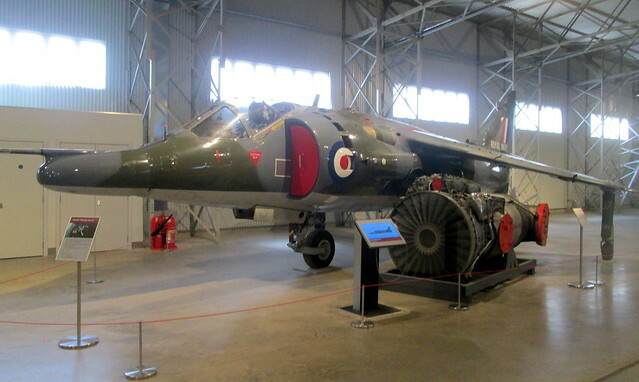 There’s a good mixture of civilian and military aeroplanes, below is a Hawker Harrier jet. 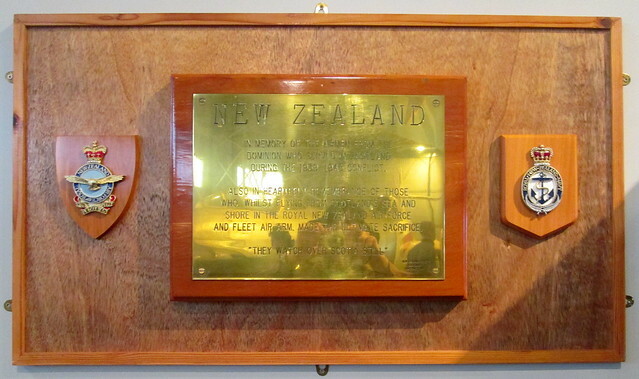 A New Zealand War Memorial. 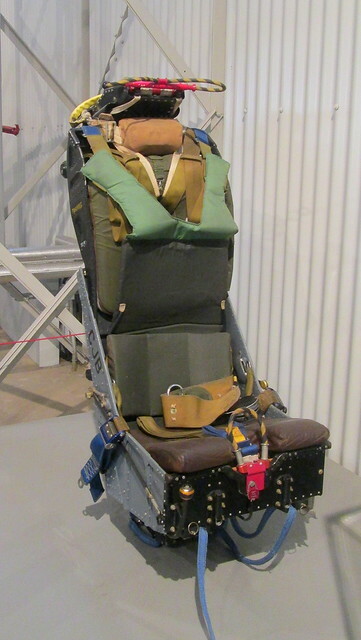 An ejector seat from the 1960s. And beside it is displayed this actual World War 1 Sopwith Camel seat which is made of wickerwork and looks like a cut down garden chair. We had to visit the cafe of course and it’s decorated with lots of stylish replica posters. I had hoped that they would have some for sale in the shop but of course they didn’t. 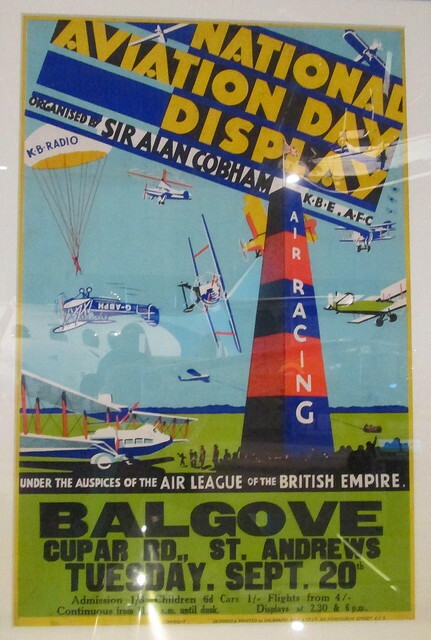 The poster below is displayed in the museum, from the days when air displays were all the rage, this one took place not that far from where I live. 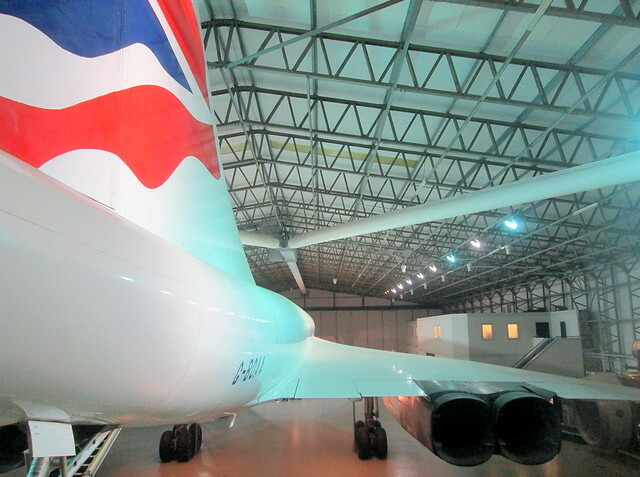 I took lots of photos, next time I’ll show some of the civilian aircraft – including Concorde. I believe there’s an RAF flypast today in London, to celebrate the 100th anniversary of the Royal Air Force. Of course in its earlier years pre-1918 it was known as the Royal Flying Corps. 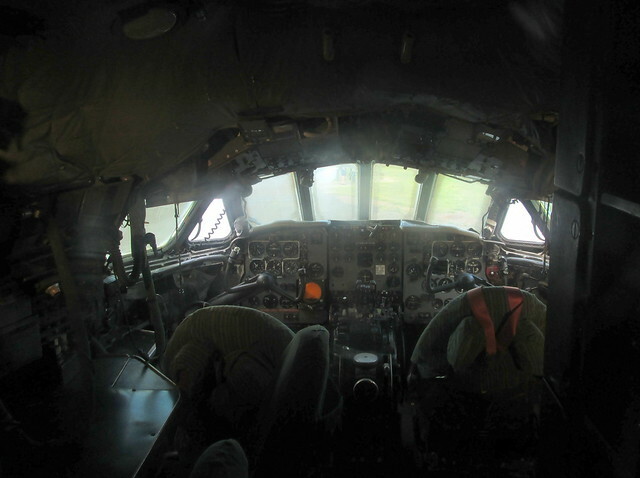 I thought it would be apt to blog about a visit we made to Montrose Air Station. 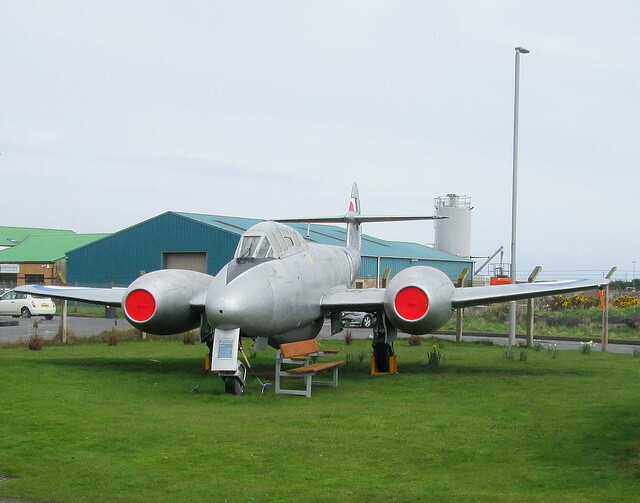 It’s a couple of months now since we visited the small air museum in Montrose. 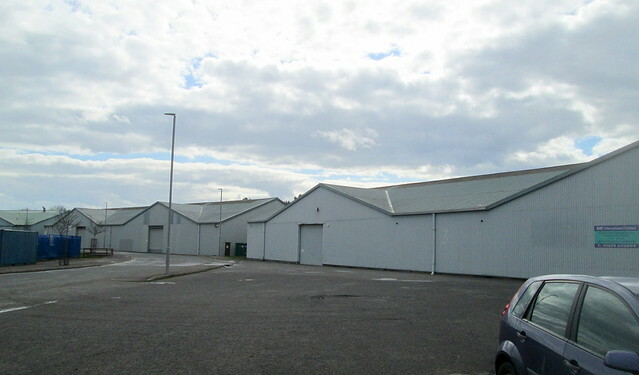 The photo above is of some of the original aircraft hangars, dating from 1913. 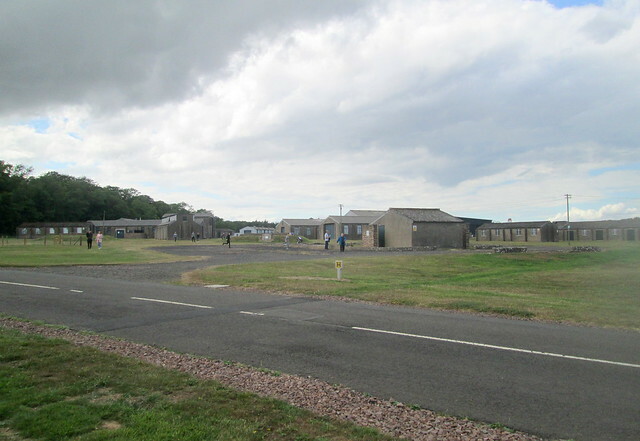 Montrose Air Station was founded in 1913 and it was Britain’s first military air station. It housed Squadron number 2 which was actually the first aeroplane squadron as number 1 was equipped only with a balloons. 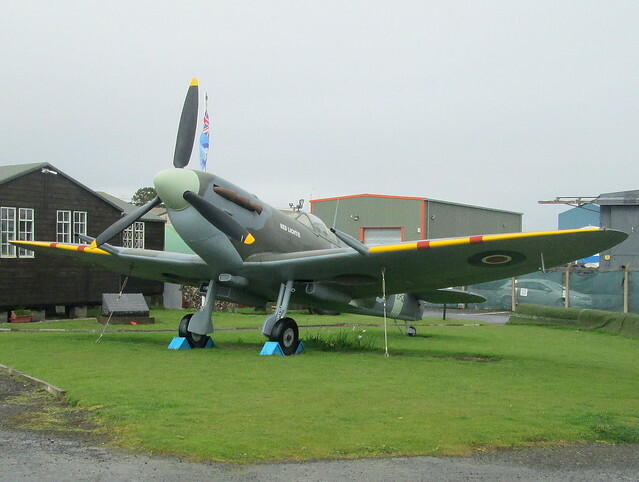 The Spitfire in the photo below is an exact replica of the Spitfire that was bought by the local community during World War 2. All over Britain communities were raising funds to buy aircraft for the war effort. There were Spitfire Funds and Tank Funds and they would usually be named after the area that raised the funds. The original aircraft hangars are still standing over 100 years on. In those days the most famous aircraft that they were training on was the Sopwith Camel. Hundreds of men were killed during training over the two world wars. There’s a Poppy Wall to commemorate them. 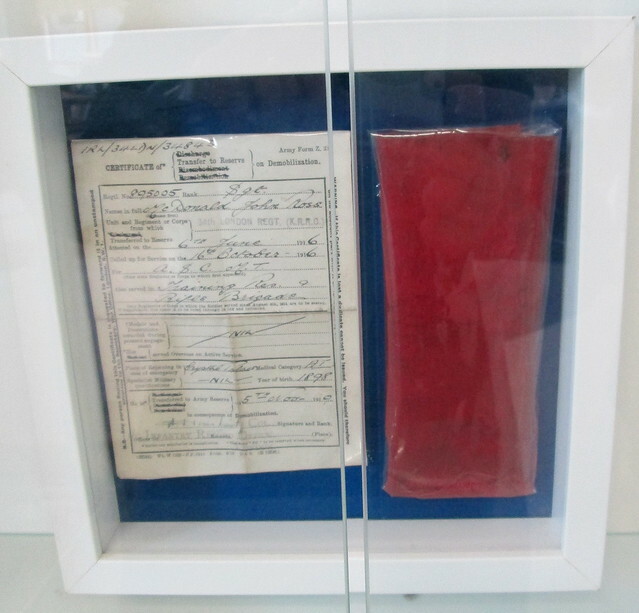 There’s a piece of The Red Baron’s aeroplane in this display case. Apparently souvenir hunters stripped it of canvas in no time. 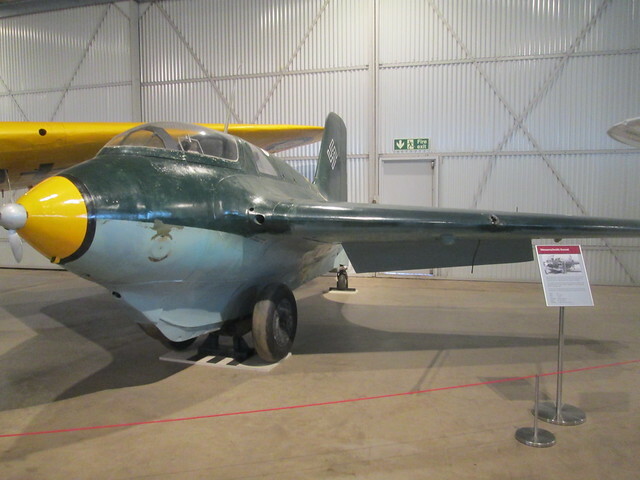 The photo below is of a Gloster Meteor. There are some very talented men making replica bi-planes and you can see them working on them. 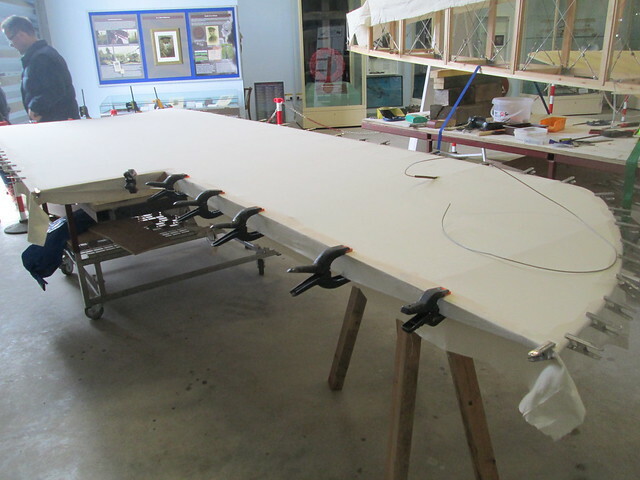 This is the wing for a Sopwith Camel. It’s not all wartime aeroplanes though. The photo below is of a Sea Hawk. 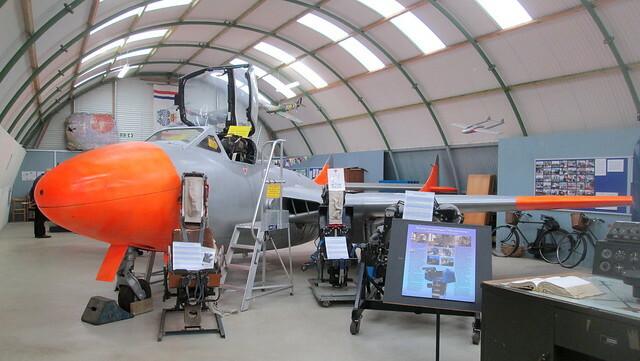 The museum is run by local volunteers, but they’ve managed to pack it with plenty of things of interest and there’s even a small building full of model aircraft from various eras. 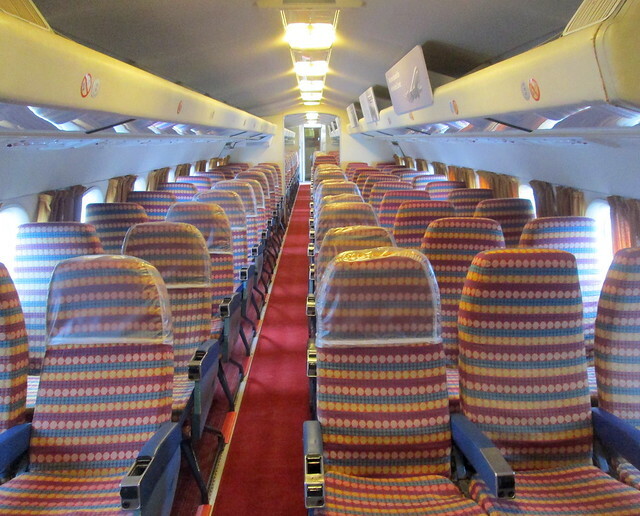 This is especially of interest to those who spent their early years glueing tiny bits of Airfix models together. 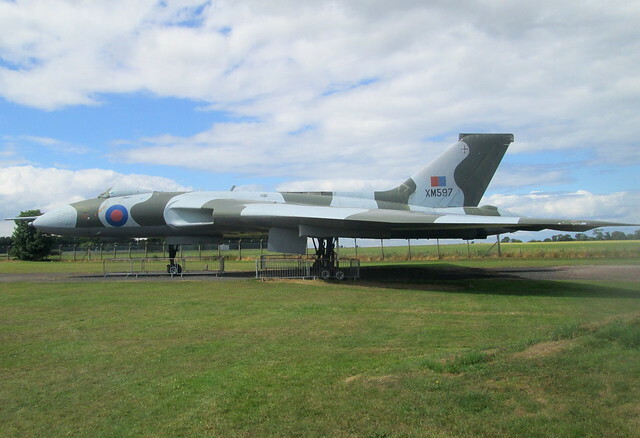 We visited this air museum after hearing an interesting talk from one of the volunteers at a local history meeting. It was mentioned that as this place was obviously the location of many traumatic deaths over the World War 1 years there was talk of there being ghosts around the place, dressed in WW1 flying uniforms, sadly we didn’t see any though! 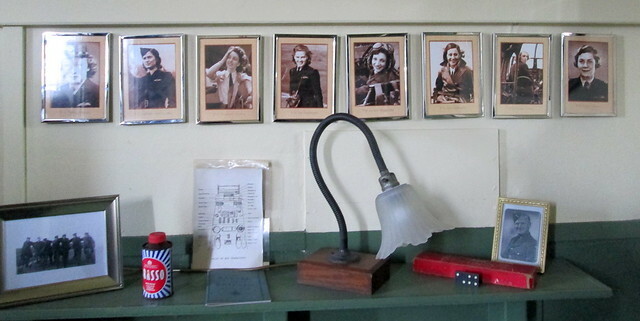 Last but certainly not least is a photo of a small display of some of the women flyers (in one of the sleeping quarters) who used to deliver World War 2 aeroplanes to various different air stations all over Britain. They weren’t allowed to be part of the fighting force but they could still do their bit. 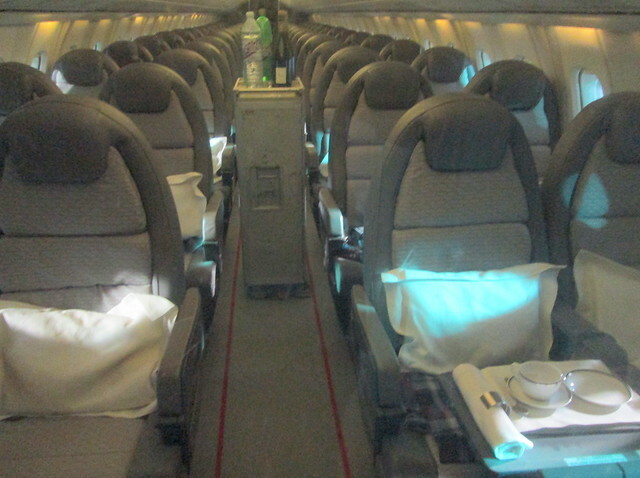 I’m quite surprised that they were allowed near the aeroplanes at all, never mind flying them! 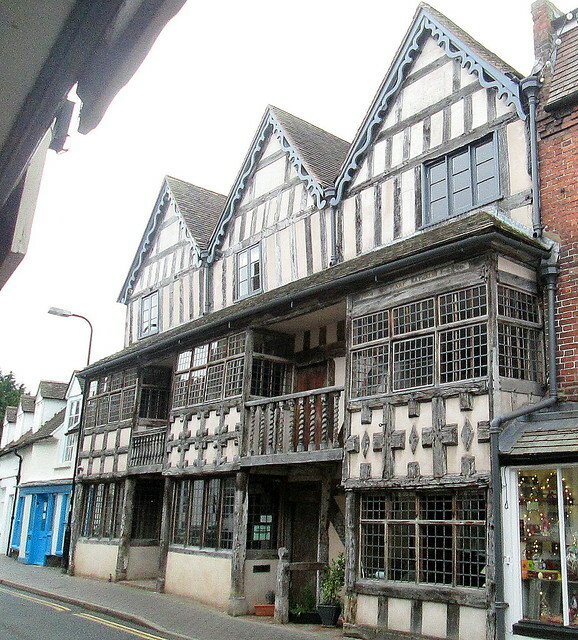 I had vaguely heard of Much Wenlock and there’s a bookshop there (it’s on a list) so we decided to visit it when we were staying in Oswestry for a few days. 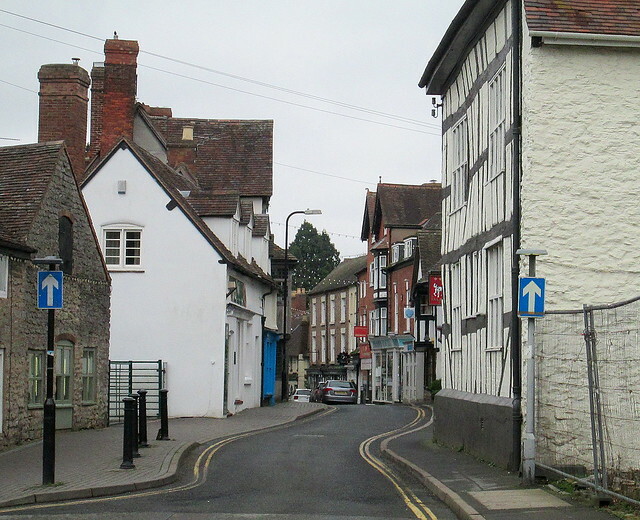 Sadly when we got there the bookshop was closed, but the town is so quaint we were happy just to have a look around it. 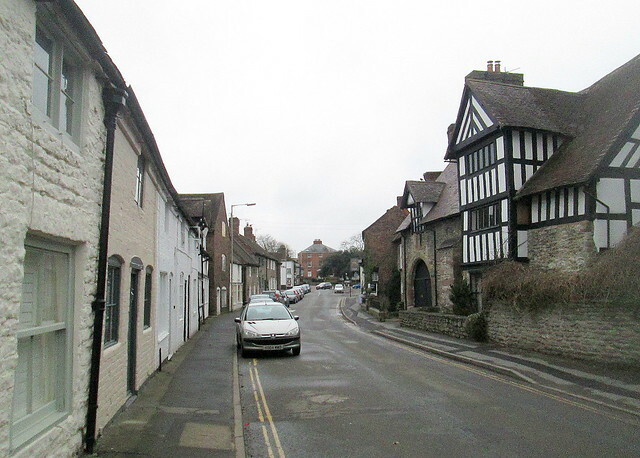 Much Wenlock is the birthplace of the modern Olympic Games apparently. The only shop that was open was a terrifying antiques shop. It’s the most jam packed shop I’ve ever been in with towers of ‘stuff’ everywhere, almost all of it very breakable too as the stock seems to consist of 99% china/pottery! We carefully negotiated the piles but were too terrified to pick anything up to look at it, we would probably have had to move six other pieces to get to anything interesting anyway. So breathing carefully, we squeezed out again – heaving a sigh of relief – no damage done. Back out on the pavement we spotted a sign pointing to the priory and made our way there. 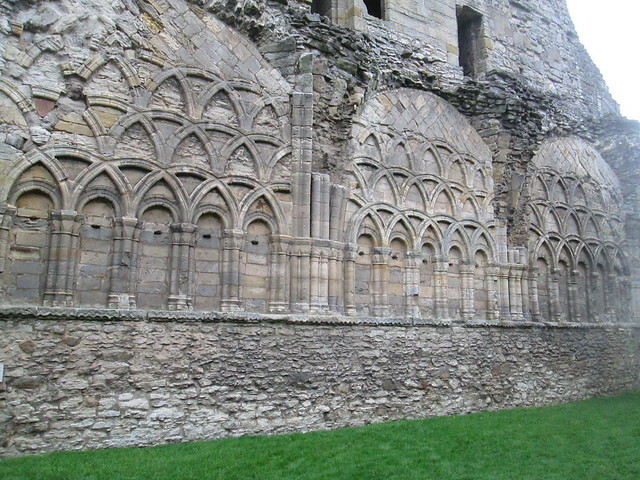 There’s actually still quite a lot to see and some of the stonework is very ornate. 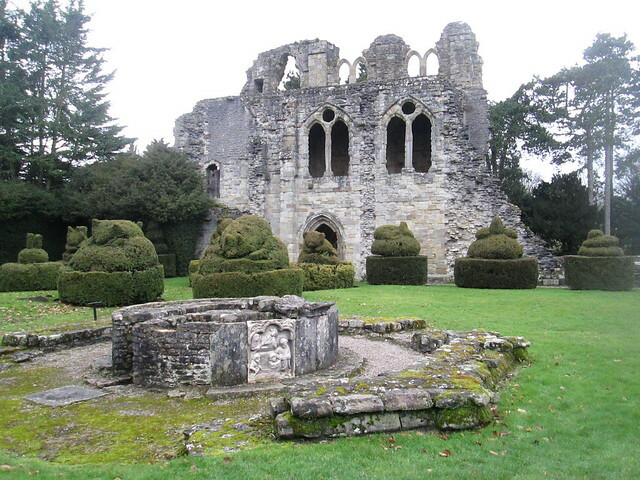 What is left dates from the 13th century. 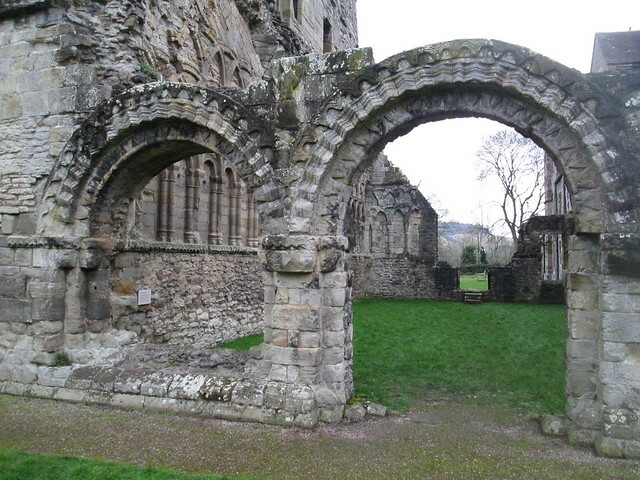 Luckily English Heritage look after it, so as we’re in Historic Scotland at the moment we didn’t have to pay to get in. 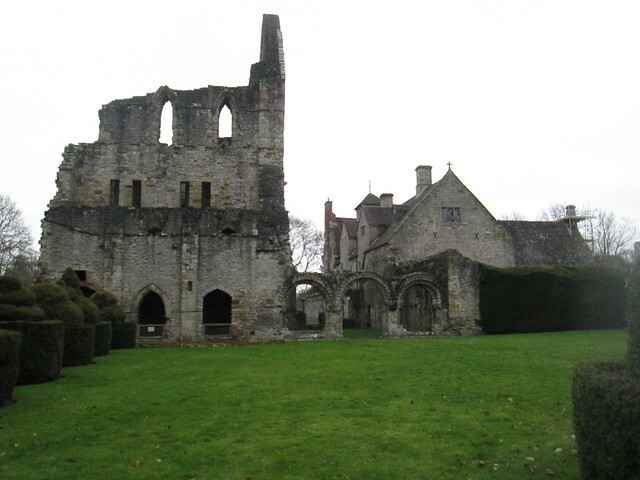 The priory must have looked fabulous in its day but over the years most of the stones have been recycled for use in local buildings as usually happens with these places. Walking back to the car I took a few photos of some not quite so ancient buildings. The one below is brick built. 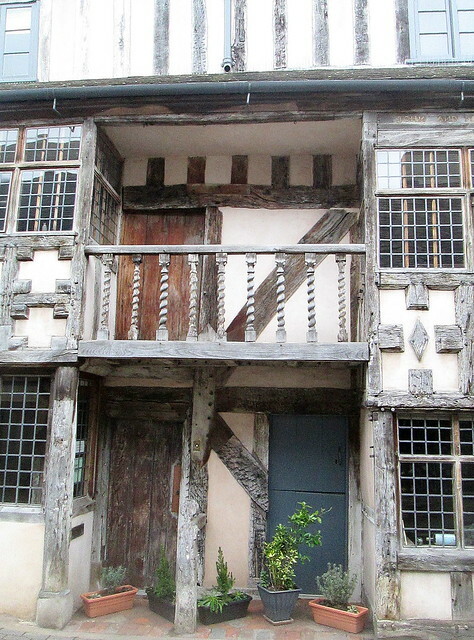 I particularly like the building below as I can just imagine people hanging over the balcony to chat to people in the street 500 years ago. 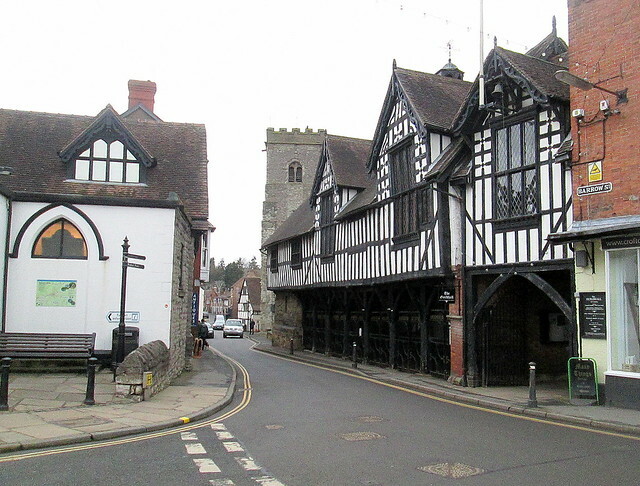 The building below is the Guildhall and is still in use. There’s quite a variety of styles around though. 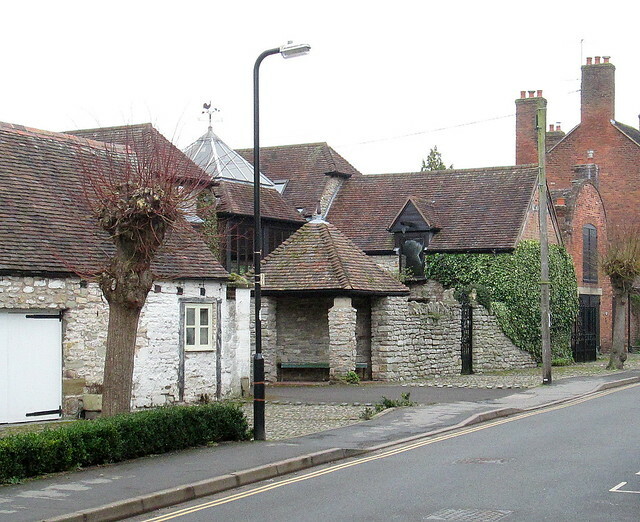 The village has been used in a few film locations, including the John Cleese film Clockwise. 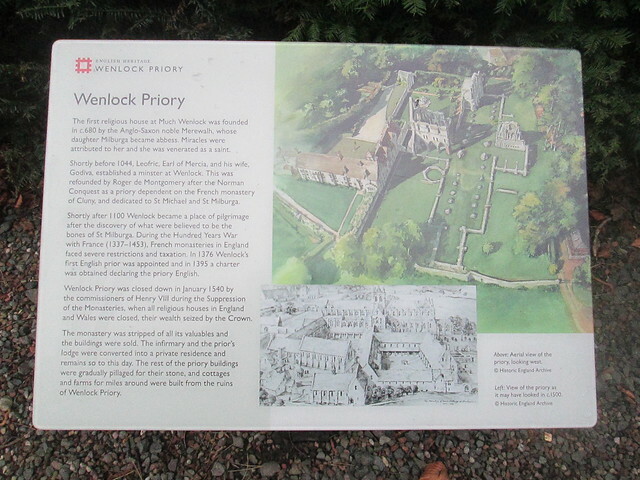 It would be nice to visit Much Wenlock when it’s actually open, so if we’re ever in that area again we’ll definitely go back. It has quite an interesting history which you can read about here. After Lorient in Brittany we set sail for Getxo which is the port for Bilbao in Spain, a first visit to that country for me, so for the first time in my life I was in the Bay of Biscay, somewhere notorious for having heavy and rough seas. What a disappointment, it was a flat calm, even the Black Watch’s captain said he had never seen it so smooth. 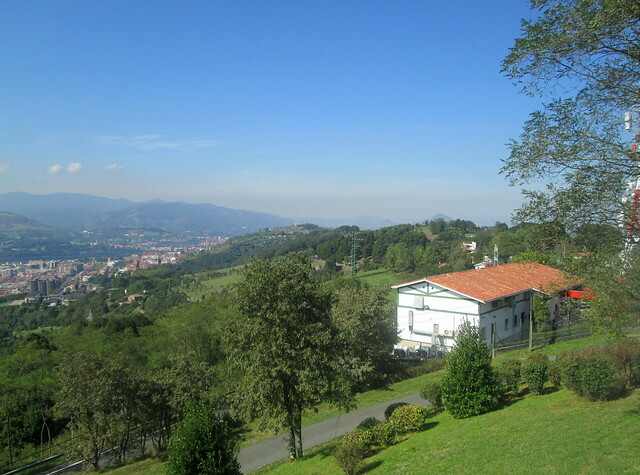 Anyway, Getxo is a lovely small town but Bilbao is some 15 miles or so away from there and Jack was worried that we might somehow miss the Guggenheim Museum if we took the trip there on our own. 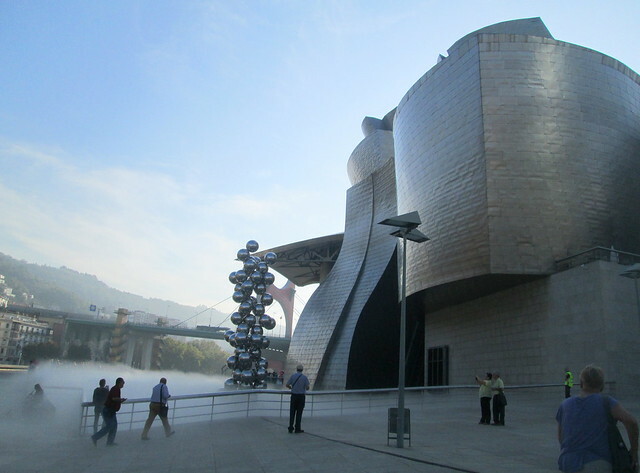 So we took one of the tours straight from the ship, scenic Bilbao and the Guggenheim. The actual Guggenheim building (above) is lovely, it’s definitely the star of the show as there isn’t really a huge amount of artworks inside it. What there is though is quite eclectic so there should be something to suit just about anyone, from small amazingly intricate drawings by Goya to a large exhibition of paintings by Francis Bacon, someone that I can see had artistic talent, but I definitely wouldn’t want anything by him hanging on my wall. There were a lot of paintings by Picasso too, from all of his periods. You aren’t allowed to take any photos of artworks in the Guggenheim, although they don’t mind you taking photos of the actual building. 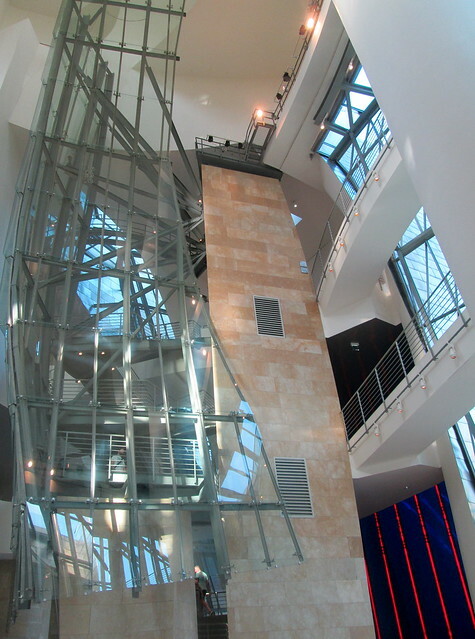 The architect, Frank Gehry was inspired by fish and you can see not only the fish shapes but also the metal internal cladding meant to depict the fish scales. Luckily for the locals there are lots of exhibits outside the building that they can enjoy without ever having to go into the museum. I loved the rolling mist that appeared and disappeared from time to time, depending on the atmospherics. The spider in the photo above has eggs inside it and it isn’t supposed to be frightening but is a tribute to motherhood as she is protecting them apparently. 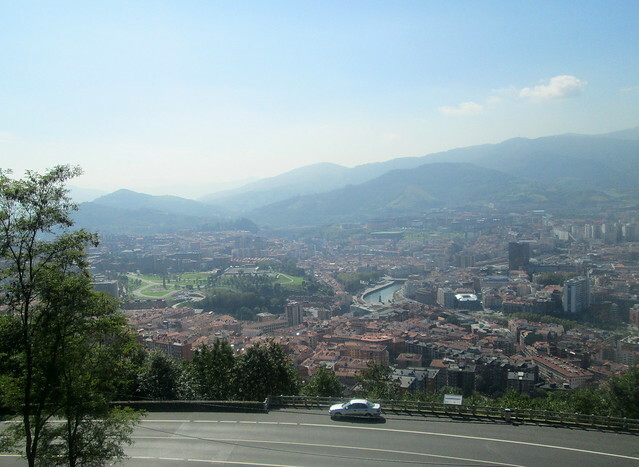 After seeing the museum and buying a few things in the shop, which seemed to be a lot cheaper than such places in the UK, we made our way back to the bus and were taken on a tour up to the hills surrounding Bilbao. It really is in a lovely setting and you can look down on the whole city from there. 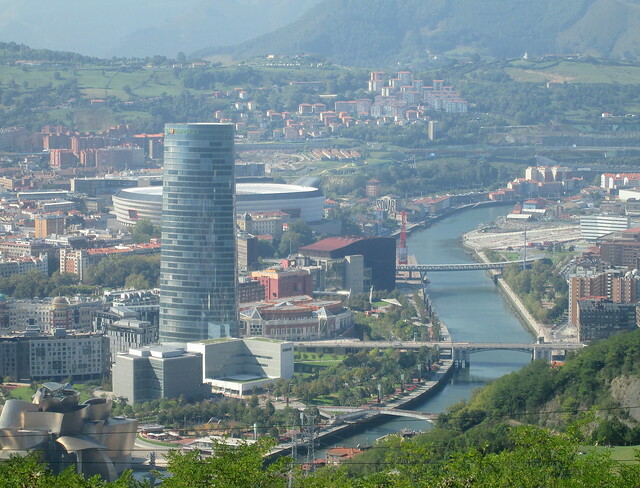 The only downside of taking the bus trip was that we really missed out on soaking up the atmosphere of Bilbao which looked very vibrant and has a reputation as a great place for entertainment. 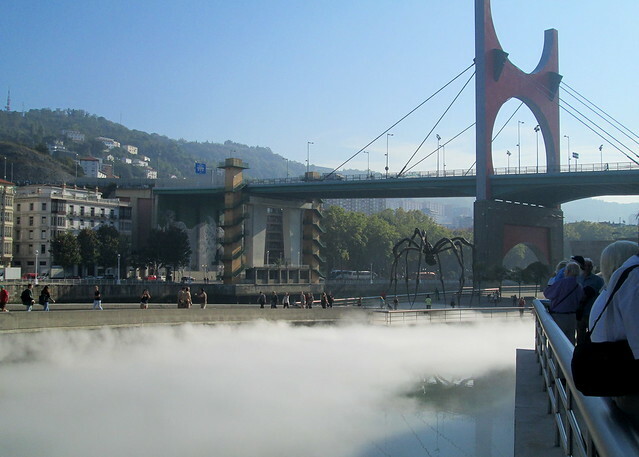 It seems to be the Spanish (Basque) equivalent of Glasgow, artistic and fun-loving. It felt quite like parts of Scotland with the surrounding hills here. They were very happy to hear that we came from Scotland as the Basque country is of course Celtic and has a strong independent culture of its own, completely different from the rest of Spain. We intend to go back there again sometime, maybe for a short city break, four days or so. The local people we spoke to were so friendly and they all spoke English. But we were very interested when Maria our tour guide mentioned that the place was well known for very fine rain that soaked you – how like home we thought! We were chuffed to discover that the Basque word for the rain is shirrimirry, very similar to the Scots word smirry for the same type of rain. We’re definitely their cousins and whenever there’s a gathering of Scottish independence folks on TV there’s nearly always someone waving a Basque flag in amongst the Saltires. It was a very hot day when we were there, around 27 C about 81 F hotter than normal for early October. 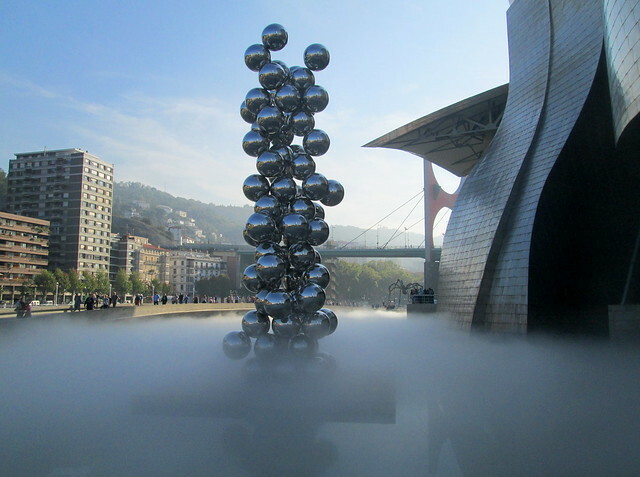 You can see more images of the Guggenheim here and Bilbao here. In Britain we say Ypres (Eeprr) in the French fashion, I’m not very good at that French ‘r’ rolling thing. Anyway, that was how it was pronounced locally at the time of World War 1. The British troops of course decided that it was much easier to call the place Wipers. After the war the Flemish people of the region decided that it was about time they dropped the French way of doing it, after all it isn’t in France it’s Belgium. 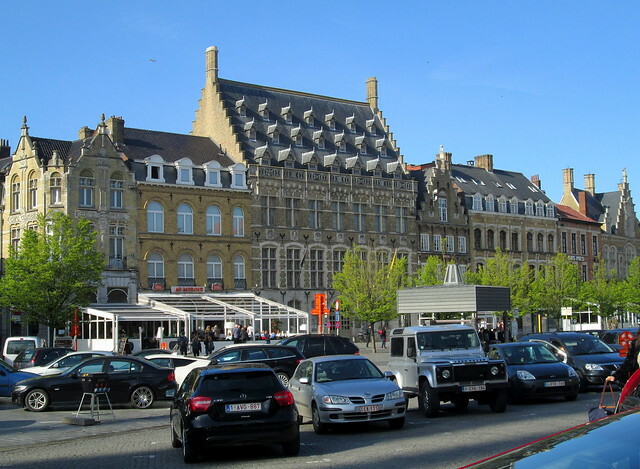 So now it’s called Ieper (Eeyeper) well that’s what it sounds like to me. The whole town was flattened as it was right on the front line, and it had been such a lovely mediaeval town too. After the war there was a discussion about what should be done about the place. 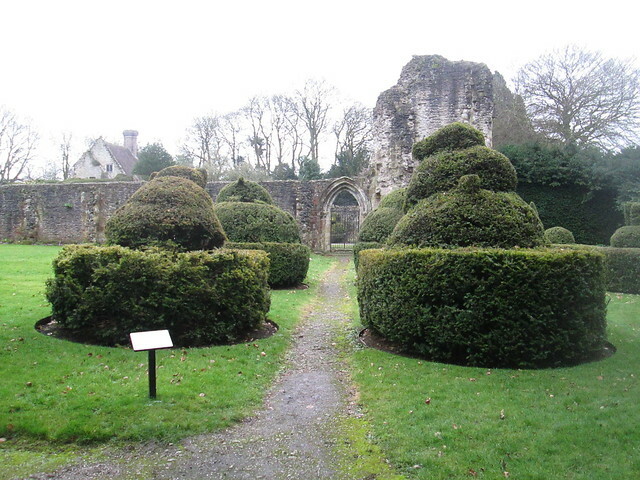 Churchill was keen to keep the whole area in ruins as a memorial to the dead. Understandably that didn’t appeal to the locals who just wanted to get back home and get on with normal life. So the decision was taken to re-build as close as possible to what had been there before, and I think they made a good job of it. The fountain above is obviously modern, I love fountains, there aren’t enough of them around, in Britain anyway. It was hot while we were there and in common with lots of old places Ypres has now and again a whiff of old drains but the town also smells of chocolate, very enticing. 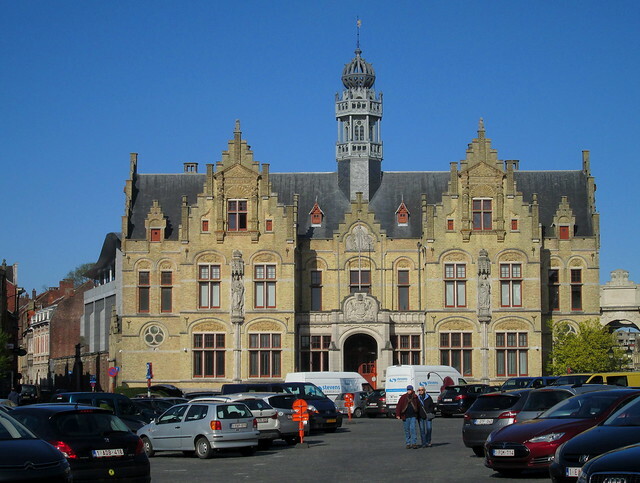 If you go to Ypres be sure to visit The Flanders Field Museum. 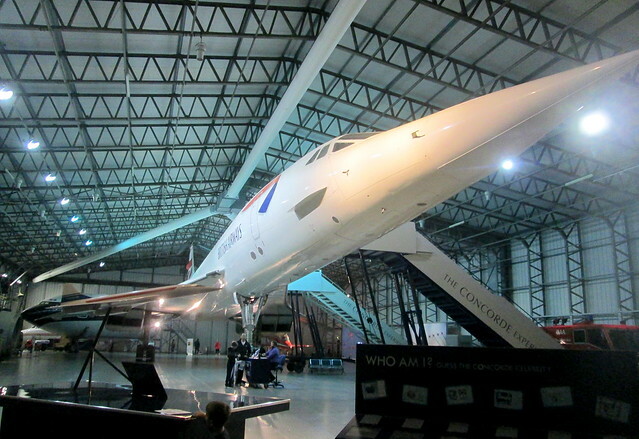 It’s one of the best museums I’ve ever visited – and I’ve visited a fair few in my time. Give yourself at least three hours to go around it. 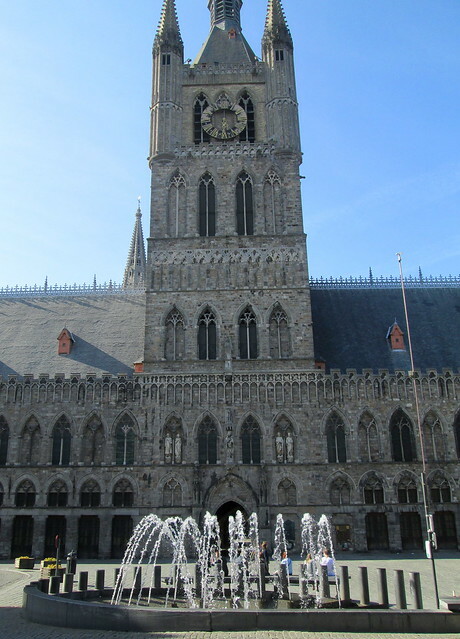 Ypres is just a small town surrounded by farmland, interspersed with many cemeteries and memorials. I read somewhere that the farmland had been very poor prior to the war, but afterwards it was the most productive farmland in Europe. I don’t know if that’s true but it is an undeniable fact that it was certainly very well fertilized, what an awful thought. 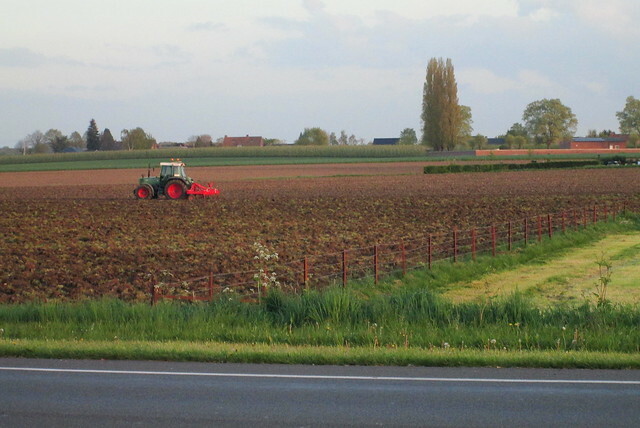 It’s a dangerous job driving a tractor on these fields as unexploded shells are ploughed up all the time and sometimes they explode when they’re disturbed, killing or maiming the poor driver. 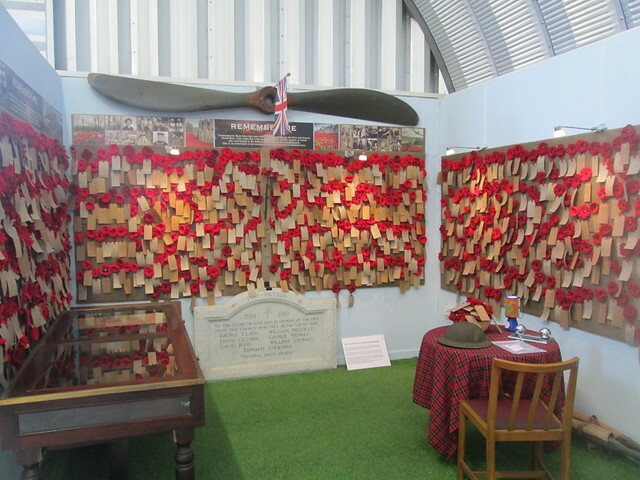 If you’re interested you can see some images of The Wipers Times here. The organist at Kelvingrove Art Gallery and Museum in Glasgow played Life on Mars today as a tribute to David Bowie and a chap called Gordon Wilson was smart enough to film it on his phone. The organ obviously isn’t the best instrument to play it on, but he makes a good job of it I think. The organ is played every day at the same time, but the last time we were there, when we had Peggy from the US with us, we weren’t lucky enough to hear it. If you’re looking for something to do in Fife and you’re interested in embroidery/textiles, you should take a look at Diamond Threads an exhibition of work by some members of Dundee Embroiderers’ Guild which is on at St Andrews Museum. 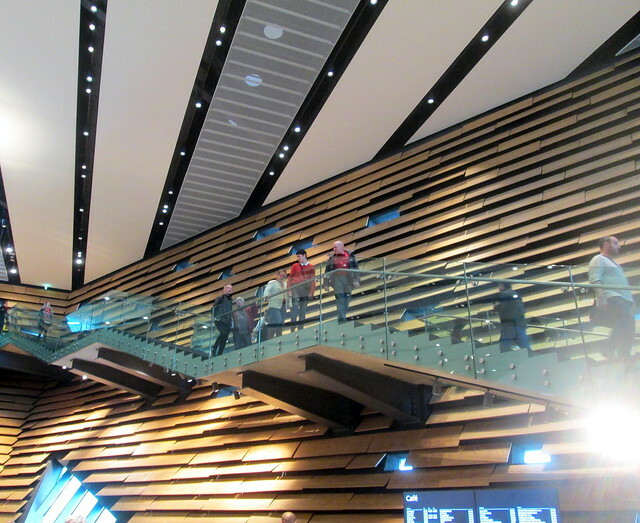 We saw the exhibition by chance as we were visiting the museum, just because we hadn’t been there for ages. 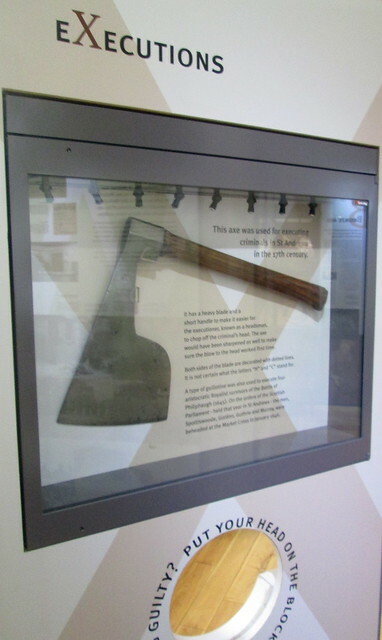 I thought you might be interested to see the axe which was used for beheading people in mediaeval St Andrews. Apparently the short handle was ideal for the job as it was easier to get a good aim at the neck and it should have meant a clean swift chop. I’m not so sure about that, fancy having to stand right next to the person who you were beheading!! 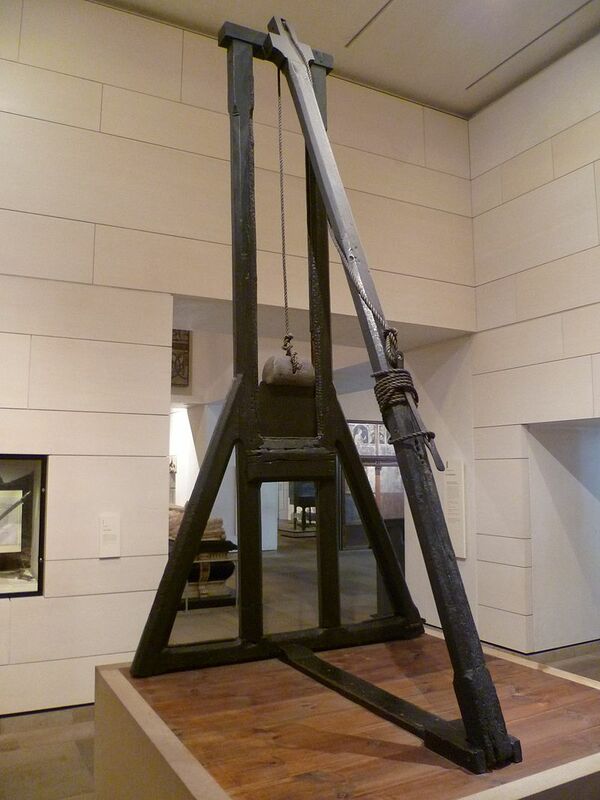 An improved method of execution was thought up – The Maiden, which was an early type of guillotine. 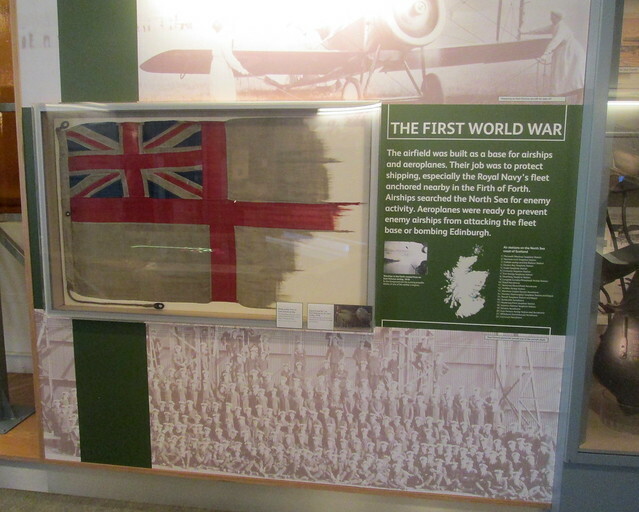 You can see an original Maiden at Edinburgh, but here’s a photo of it. I hope it doesn’t put you off your dinner!